When people are in a temperature controlled environment, they are not always in agreement with what the temperature should be set at. A room that is 72 degrees Fahrenheit can feel hot to some people and cold to others. Most homes and buildings waste an enormous amount of energy (and money) overheating/cooling rooms. Additionally, there are a number of medical patients where their thermal comfort level is a crucial part of their treatment. A patient suffering from posttraumatic stress disorder (PTSD) is extremely dependent on their thermal comfort level. A long-term solution to this problem is to develop a smart home thermostat that uses computer vison to automatically detect a person’s thermal comfort level and adjust the room temperature accordingly. Computer vision coupled with machine learning are vastly growing fields of research that have the potential to predict a person’s thermal comfort level. This smart thermostat will save home owners and buildings managers lots money. Why waste energy heating your whole house if you are only in one room at a time? The best part is that it is hands free! Another useful product of thermal comfort prediction is the ability to create micro-controlled environments for the workplace. This can be envisioned as a worker’s desk that has it’s own heating/cooling vent and a camera that predicts the worker’s thermal comfort. There have been many studies on the Thermal Comfort of both people and animals. Studies have used Thermal Comfort as an indicator of the observed person’s happiness in their environment. This research is important to office designers and car manufacturers, who want to maximize happiness of people in their spaces. Recently, there have been more energy efficient buildings which rely on new methods for cooling/heating. To test different systems effectiveness there has been research using the building inhabitants’ thermal comfort as an indicator of effectiveness. Specifically in subtropical climates which tend to be hot and humid, like southeast Asia, the invention of air conditioning has been called by the previous Prime Minister of Singapore “one of the signal inventions of history.” Because of this there is a significant interest in research on optimizing the energy use and effectiveness of cooling systems in those areas. 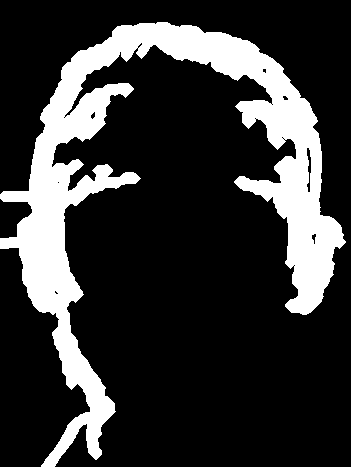 We compiled a dataset with roughly 2000+ color and thermal headshots of people. We used a Raspberry Pi camera (color) and a Flir Lepton 3 infrared camera (thermal) to take the images. The two cameras were positioned side-by-side, with the lenses roughly an inch apart. When we captured a headshot of a person, we saved 10 consecutive frames from both cameras. This gave us 10 color and 10 thermal images within the span of a second for each person. Additonally, when we surveyed a person, we asked them to fill out a short questionnaire asking what they think the temperature is, and what their thermal comfort level is with regard to the temperature. As a result, we have labeled data that can be used for machine learning to predict thermal comfort level. Below are samples of the raw color and thermal images that the camera system captured. Color image used as input for Part 1. Color image used as input for Part 2. Thermal image used as input for Part 1. Thermal image used as input for Part 2. 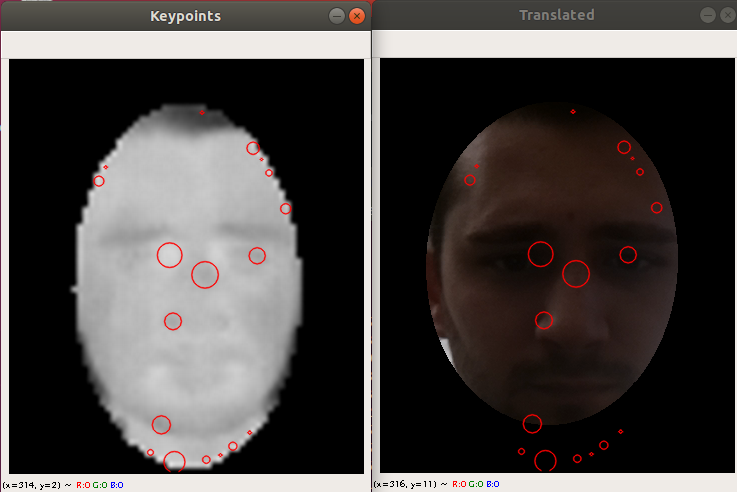 Fit an ellipse to the facial region of each image (both color and thermal). Detect specific regions on the face that have the potential to be useful for predicting thermal comfort. These two goals are small pieces of a long-term research project to predict the thermal comfort of a person. For the most part, Karl worked on part 1 and Joseph worked on part 2. The first step in preparing the data for machine learning is to extract the facial region of both the color and thermal images. 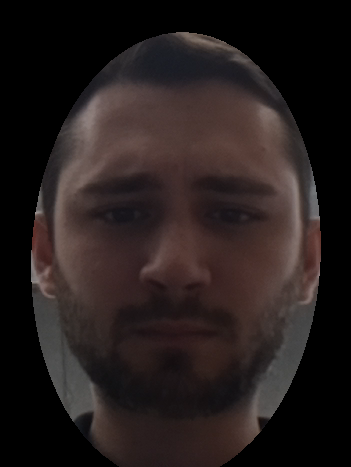 We decided that the preprocessed data would be best for the machine learning model if we fit an ellipse around the face. That way, if the cropped face ellipse is rotated, it is simple math to translate it such that the axes are square for all images. 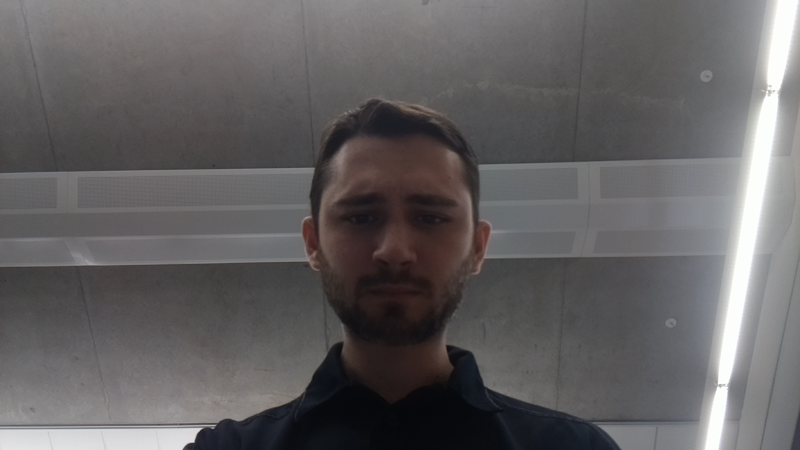 After that, we can easily scale the rotated face ellipses so that all of the faces ellipses are the same sized image. For this project, we were able to complete the face ellipse cropping portion. We have yet to rotate and scale the ellipses for all of the data. 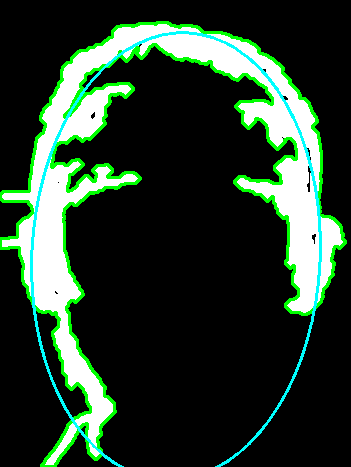 After an ellipse of the face is found, we want to detect the hottest features on the face as well as other potential regions of interest. Initiallyt, the goal was to line up checks, forehead, lips, etc. in the thermal image and the color image, but this was challenging and not as benifical in the long term as we initially thought. Instead, we tried blob detection to find the interest regions directly in the thermal image and correlate their location to the color image. This can be used to create a ML model for determining whether a person is comfortable or not in the given temperature. 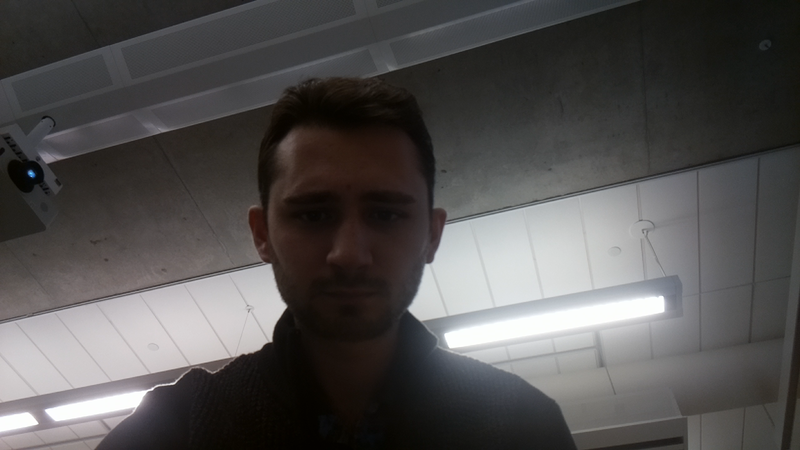 Run harr cascade face detection on the first image. 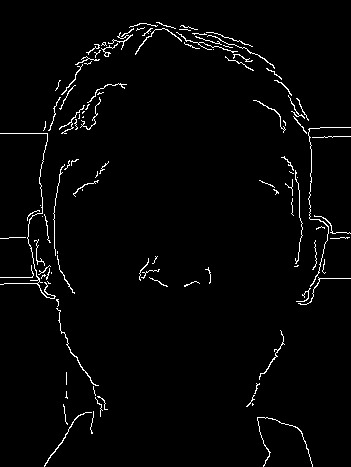 Since the result of the face detection only returns a rough area of where it thinks the face is, we extend the detected face region by a substantial percentage so that the entire head is in the frame. At this point, we crop out the head region in the 1st and 10th images of the headshot sequence. Below is what we have after the first two steps. 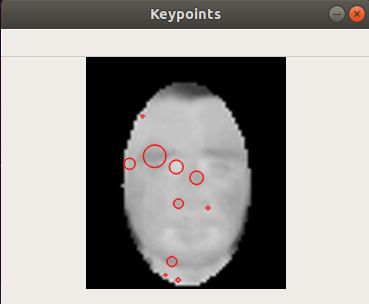 The green box is the result of the harr cascade face detection. The blue box is the region that we crop out to use for the remaining steps. Then, we run Canny edge detector on the two headshot images. Canny returns a binary image where only strong edges are detected. Next, we find the absolute value of the difference between the two Canny images. We assume that the person’s head is in the foreground and everything in the background is much further away. The sequence of 10 headshots takes around 1 second to perform, so the likelyhood that the person moves (even slightly) is high. Because they are in the foreground of the image, the distance that they move (in terms of pixels) is larger than the distance that the background moves. Now, we perform a series of erosions and dilations on the image. Then we keep the largest object of the image (the head). This helps erase edges that were in the background of the image. We perform more erosions and dilations on the image. Now that we have a single connected component, we are able to find the contours of the binary image. Using the contour points, we can fit an ellipse to the image. Finally, we are able to crop out the ellipse of the face region of the 1st image. 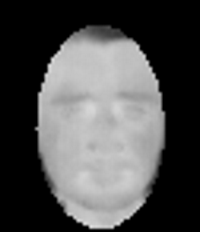 Since the result of the face detection only returns a rough area of where it thinks the face is, we extend the detected face region by a substantial percentage so that the entire head is in the frame. At this point, we crop out the head region in the 1st image. Now, we threshold the grayscale image with a simple threshold of [50,255]. Next, we erode the thresholded image. We keep the largest object of the image (the head). This helps erase edges that were in the background of the image. Then we dilate the image again. Using the contour points, we can fit an ellipse to the image. This allows us to create a mask that is the shape of the ellipse. CV has a library for SimpleBlobDetection. It was challenging to run that on the IR images since they are so small and the blob detection wants to run on larger images. 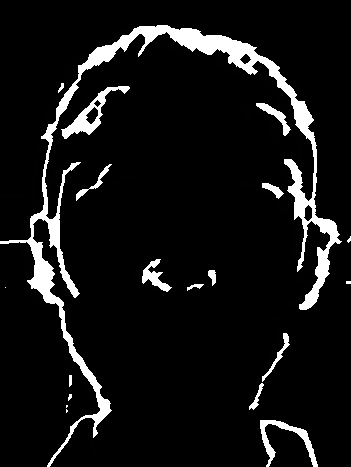 Running the blob detection on a regular image finds the part of the image that are most light. We turn off shape detecting and choose intensity and size detection properties. Our points of interest are places where there is an especially dark blob in a light section or especially light blob in a dark section. Being good insulators, the eyebrows seems to often get caught with a large detect, which could be better, but also makes sense. Aligning the key points must also be done a bit intelligently since a the faces are not perfectly aligned between the regular/IR images nor are the image proportions the same. 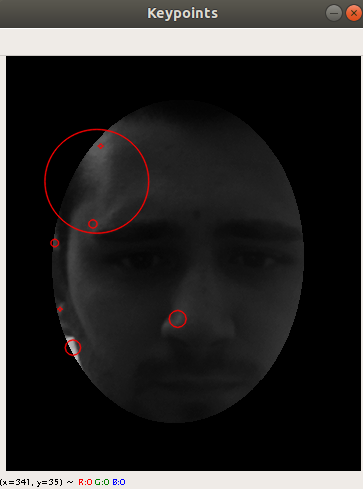 The first method we tried for fitting the ellipse was skin detection. This had terrible results. Using the difference to detect the foreground object is only good if the Canny edge detection is performed first. If there is a light in the background (ceiling light or window), then the color image nearly useless for thermal comfort prediction becasue the face becomes a silhouette with very little color difference on the skin. The thermal image will be the best way to predict thermal comfort. However, our thermal camera has an extremely small resolution. This poses the the biggest problem on our dataset. The thermal image might only need the thresholding to find contours that will fit an ellipse. Formatting image data for different processes is hard. A model for guessing Thermal Comfort given an IR image seems plausible. A model for guessing Thermal Comfort given a regular image of a face seems less plausible. Thermal-comfort-computer-vision is maintained by jschiarizzi. This page was generated by GitHub Pages.